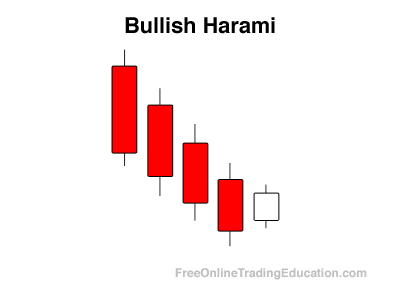 The Bullish Harami is a two bar candlestick pattern that develops after a down leg. Each of the two candlesticks has an opposite color. After a sell-off in price, this pattern is formed when the real body of the second candlestick trades completely within the range of the real body of the previous candlestick. Technical analysts often use the Bullish Harami candlestick pattern as a signal to buy an asset. This is usually taken into context with another buy pattern for an added amount of confirmation.